SQLearn’s VLMS is a web based e-learning system specifically designed for the shipping industry. VLMS is offered via VLMS box, a hardware solution for onboard training. VLMS box can be used either as an e-learning dedicated mini server or as a workstation. When used as a server users can access elearning courses within the local network on the vessel using their own PCs or dedicated workstations. When VLMS box is paired with a keyboard/mouse and a screen it can be used as a dedicated workstation. Using either method VLMS box allows users to access e-learning courses stored in VLMS box while their activity is synchronized with an ashore cloud installation called HQ LMS. HQ LMS allows the crew manager to manage and monitor the training process across the fleet in real time. VLMS can be used from any modern PC and helps the crew as well as the officers to access training resources and assessments. Content (e-learning courses) and user accounts are synced from HQ LMS to VLMS installations and consequent actions (reports) of the users onboard are sent back to HQ LMS. The technology used in VLMS allows seamless use in conditions with low internet connection speed or no internet connection at all. HQ LMS and VLMS communicate securely and effectively. 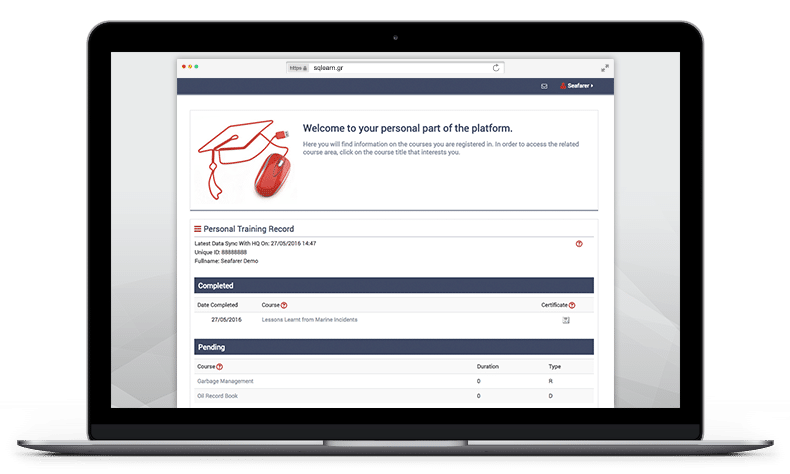 Personal seafarer training record where each user can view: Completed and pending courses (e-learning and ashore training) • Print certificates • View complete training history per vessel. Quizzes and assessments of various types (true/false, multiple choice, multiple responses, matching, pick one/many, sequence, etc.) can be included in a course. Quizzes constitute a way to revise the theory that has been obtained during the training process so that users have the opportunity to self-evaluate the comprehended knowledge. Each question can provide users with a corresponding feedback. The purpose of the feedback is to let users understand why their responses are correct or incorrect, while at the same time, give them the opportunity to revise the theory. Furthermore, quizzes and assessments can be used as final evaluation of a course or seminar in a strict manner, limiting the attempts a user has to complete the assessment, imposing a time limit and a grade threshold that should be passed (e.g over 80%) in order for the attempt to be considered successful. Users that successfully complete a course can be allowed to print a certificate as proof. A certification code engine produces unique certificate codes on the vessels and ashore, ensuring the validity of each produced certificate. The collective reporting module of Dolphin System helps crew managers to monitor and manage the training courses that are available in every vessel. Each vessel installation sends automatically all training reports from every vessel to the ashore installation, where aggregated reporting information is stored. The Dolphin system allows sending files, including courses and documents, from the ashore installation to all vessel installations. Subsequently the enrollment of the users to courses is also sent remotely along with the respective commands so as the user enrollments are performed automatically on each vessel. Other course related operations can also be performed remotely on each vessel’s installation. The VLMS system is provided with a Software as a Service (SaaS) license. Technical support and monitoring of the system is performed by SQLearn ensuring that the involvement of your company’s IT personnel is kept to a minimum. Hosting of HQ LMS is cloud based, SSAE16 SOC-2 Type II certified. SQLearn e-learning facilities, the e-learning platform and e-learning courses, are certified by the American Bureau of Shipping (ABS) according to ABS Standards for Certification of Maritime Education Facilities & Training Courses.